Cottonseed hulls are the outer coverings of cotton seeds, and the by-products of the dehulling necessary for cottonseed oil extraction. After removing the lint, the hulls are separated from the kernel by screening. Cottonseed hulls are a fibrous product, primarily used to feed ruminants (Hall et al., 2000). Cottonseed hulls are fed as a bulk feed, or pelleted. They are sometimes mixed with cottonseed meal to create a higher density product that is easier to transport and handle (Blasi et al., 2002). Cottonseed hulls are one of the best roughages used to add bulk to diets rich in protein and energy, in order to reduce digestive upsets in ruminants (Lane, 2006). Cottonseed hulls are a valuable substrate for mushroom cultivation and the spent substrate can be fed to livestock (Bae et al., 2006; Miles et al., 2004; Yang et al., 1986). 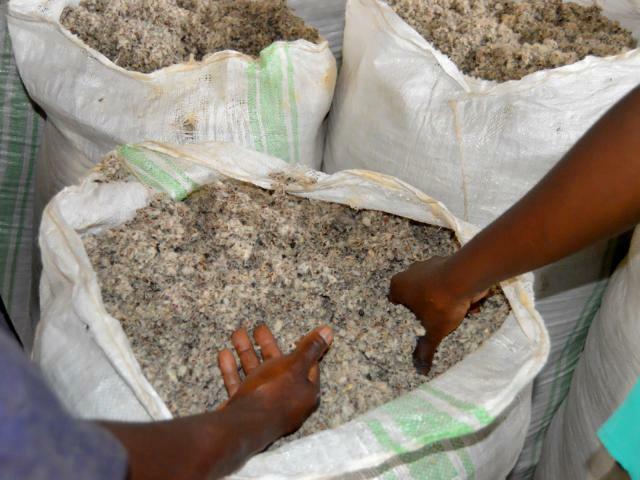 Cottonseed hulls also have numerous industrial uses such as plastic manufacture, oil drilling (mud additive) and furfural production (a solvent used in plastic and synthetic rubber production and in petroleum refining) (NCPA, 2011). 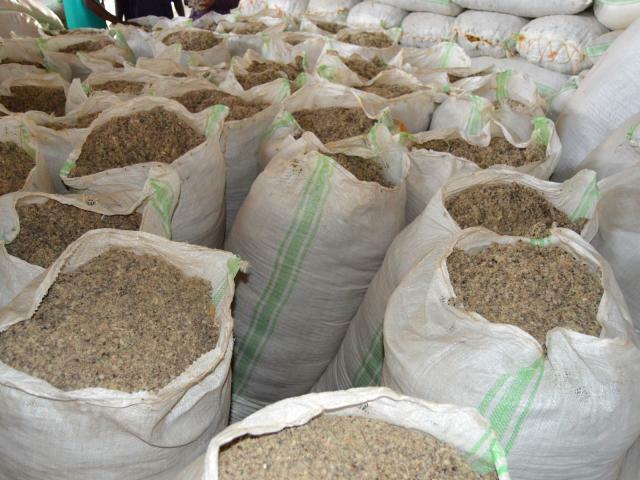 Cottonseed hulls are available at the mill producing cottonseed oil and cottonseed meal. Due to their low density, they may be difficult to transport and are thus confined to a fairly restricted market radius (Blasi et al., 2002). They can be mixed with cottonseed meal. In the USA, the use of cottonseed hulls in pellets increased in the late 1990s (Coombs et al., 1996). The demand for hulls and, therefore, the prices vary considerably with changes in the availability of other roughages (NCPA, 2011). Cottonseed hulls used in complete mixed rations for dairy cows were shown to reduce greenhouse gas (CH4) production (Bo et al., 2012). Cottonseed hulls are a low-protein (3-9% DM), highly fibrous by-product (ADF 57-73% DM) mostly used for ruminant feeding. Cottonseed hulls do not contain significant amounts of free gossypol: reported values are lower than 0.1% DM (Mujahid et al., 2000b; Noftsger et al., 2000), about ten times less than in the seed (see the Cotton seeds datasheet). Consequently, feeding animals with cottonseed hulls is less likely to result in negative effects due to gossypol. However, there have been several reports on the risk of feeding cottonseed hulls to livestock. When cottonseed hulls were fed to fattening lambs for a long period (8 months), it was found that gossypol accumulated in the testis, liver, kidney, spleen and muscle (in order of decreasing content) (Tuerxhun et al., 2010). Meat inspection of 1004 Karakul sheep, slaughtered in Uzbekistan in the late 1980s, revealed hepatosis in 41%, cirrhosis in 11% and multiple abscesses of the liver in 4% of the cases. In a trial on 30 sheep fed 2 kg/d of cottonseed hulls, liver disease developed within 2 months and values for blood albumin and glucose were low (Norbaev, 1989). In Russia, several poisoning incidents in pigs (mortality up to 30%) have been reported following the feeding of cottonseed meal and cottonseed hulls (Tishkov et al., 1988). Cottonseed hulls contain condensed tannins (3-7% DM), mainly bound to protein and fibre (Yu et al., 1996). However, it seems that the condensed tannins of cottonseed hulls do not significantly reduce the rumen protein solubility (Yu et al., 1995a; Yu et al., 1995b). Cottonseed hulls are used in ruminant feeding in areas of cotton growing. They are palatable, compared to other fibrous by-products, and have a stimulatory effect on feed intake in diets with limited fibre content. They were shown to increase intake compared to sunflower hulls and peanut hulls (Coppock et al., 1987). Cottonseed hulls have been included at various levels (5 to 50%) in total mixed rations and complete feeds for lactating dairy cows (Klopfenstein et al., 1981; Blasi et al., 2002). When compared to other fibrous by-products (sunflower hulls, sugarcane bagasse) or forages (Bermuda grass, maize silage, sorghum silage or sugarcane silage), cottonseed hulls generally give similar or higher milk yield, and higher milk fat content (Klopfenstein et al., 1981). For dairy cows, cottonseed hulls are a valuable source of fibre when introduced in diets with high starch content because they slightly increase intake and nitrogen retention (Beckman et al., 2005), improve starch digestion by increasing rumination, and reduce the amount of whole maize passing through the digestive tract (Blasi et al., 2002). They tend to increase the milk fat content without reducing milk yield (Beckman et al., 2005). However, as cottonseed hulls are low in protein, a supplement may be necessary to balance the diet, particularly when high levels of hulls are used. Cottonseed hulls can be included into complete feeds in a pelleted or non-pelleted form without any difference in milk yield (Brown et al., 1977). In Brazil, cottonseed hulls replaced up to half of the Pennisetum purpureum silage (60% in the diet) in a complete diet for fattening steers, increasing the daily DM intake from 6.6 kg to 8.3 kg without altering DM digestibility (54-55.6%) (Chizzotti et al., 2005). In India, feeding complete diets based on cottonseed hulls (60%) to crossbred calves improved growth rate, feed conversion efficiency and nutrient utilization compared to complete diets based on wheat straw. Flaking did not improve nutrient utilization and growth but increased bulk density, which may reduce the cost of handling, transportation and storage (Ramachandran et al., 2008). In India, a diet based on chopped sorghum straw, fed to crossbred bulls, and supplemented with cottonseed hulls, at 50% (diet DM) or a mixture of cottonseed hulls (35%) and alfafa hay (15%), resulted in a greater DM intake and was more digestible than a conventional diet (concentrate + straw) (Reddy et al., 1999). In the USA, cottonseed hulls were used as a forage source (20 or 25%) instead of alfalfa hay in a complete diet for 325 kg fattening steers (Bartle et al., 1994), and 200 kg growing beef heifers (Hale et al., 1969). In both trials cottonseed hulls did not affect the daily weight gain of the steers and heifers (1560 g/d and 670 g/d respectively), but increased DM intake (+ 0.8 kg/d and + 0.52 kg/d respectively). At a higher level (30% cottonseed hulls), DM intake increased (+ 0.5 kg/d) but daily weight gain decreased to 1445 g/d (Bartle et al., 1994). Adding molasses (9%) to cottonseed hulls into the diet of growing beef heifer increased growth performance to 750 g/d (Hale et al., 1969). In another comparison between cottonseed hulls and alfalfa hay, where steers were fed either feed at 8% of the diet DM for 103 days, those fed cottonseed hulls had a lower average daily gain (1930 vs. 2130 g/d) and showed a tendency to have fatter carcasses and a worse carcass classification (Markham et al., 2002). Replacement of rice bran with up to 20% cottonseed hulls did not affect the milk yield or milk fat content of Murrah buffaloes (Naidu et al., 1981). Cottonseed hulls are capable of supporting moderate growth rates in sheep. With lambs, a diet of cottonseed hulls + urea + 50 g lucerne + vitamins/minerals resulted in a growth rate of 75 g/d and a whool growth of 6.1 g/d. When a small amount of by-pass protein was added to this diet, the growth rate of lambs exceeded 130 g/day and wool growth was increased to 9 g/day. Investigation of the rumens of these animals showed that protozoa were either eliminated or in very low population densities. This could explain why cottonseed hulls support adequate growth rates, even without supplementation with by-pass protein. 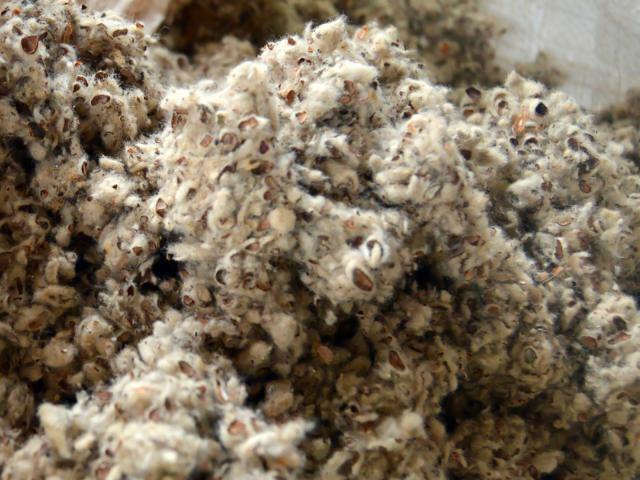 Intake of cottonseed hulls by sheep was higher (1 kg DM/day) than would be expected of feed with a digestibility of about 40%, possibly associated with a rapid breakdown of the indigestible material in the rumen (Davis et al., 1989). 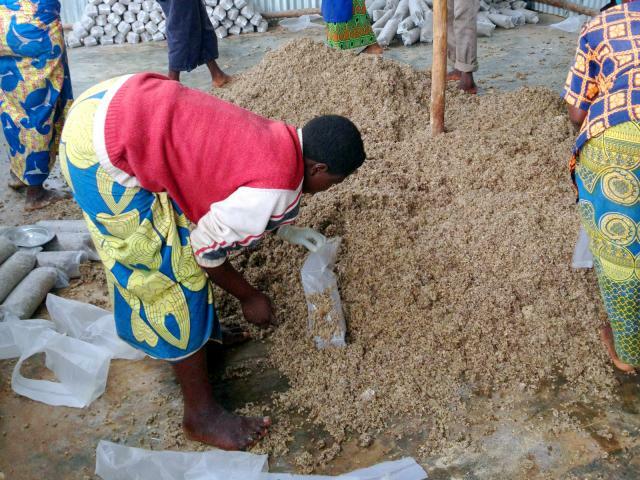 In Benin, replacement of all or 50% of the cottonseed meal with a 60:40 cottonseed meal and cottonseed hulls mix to supplement Guinea grass-based diets, for fattening Djallonke sheep (1 year, 18 kg LW) for 60 days, had no effect on carcass yield and characteristics, but resulted in a net profit (Alkoiret et al., 2007). In China, when cottonseed hulls replaced the traditional fibre source, in a complete diet for fattening sheep from three months of age, until slaughter at eight months, daily weight gain was unaffected and carcass characteristics improved (Tuerxhun et al., 2010). In China, pigs were offered cottonseed hulls after their use as a growth medium for 4 crops of mushrooms (Pleurotus sp.). The optimum inclusion was 10% of the diet mixed with concentrates, which gave the same growth rate and carcass quality as a control diet (Yang et al., 1986). Cottonseed hulls can be assumed to be a suitable source of fibre for rabbit feeding even though no direct experimental evidence has been reported yet in the literature (October 2013). This assumption is based on their use in ruminant diets at up to 20% (see Ruminants above). This position is reinforced by the negligible level of gossypol observed in the cottonseed hulls, including those from cotton varieties with a high level on gossypol in the kernel (Yu et al., 1993). The resistance of hulls to the development of mould contamination through Aspergillus flavus and the subsequent very low risk of aflatoxins developing is another positive point (Mayne et al., 1966). The high level of lignin in cottonseed hulls (18-20%) should also be considered as an advantage for maintaining the digestive health of rabbits (Gidenne et al., 2010). The digestible energy content of cottonseed hulls was estimated, using equations, as 5.7 MJ/kg DM, and the protein digestibility as about 22% (Lebas, 2013). Coombs, D. F. ; Pontif, J. E., 1996. An evaluation of cottonseed hulls and cottonseed hull pellets in beef cattle diets. Annual Research Sumamary, Dean Lee Research Station, LAES, p. 3.